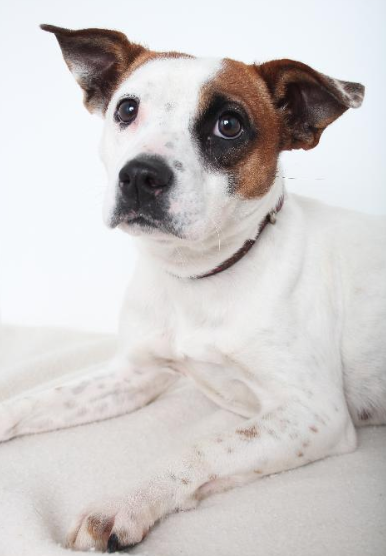 Capelli is a very sweet three year old jack russell and pitbull terrier mix who is looking for her forever home. Secondhand Hounds pulled her from a high kill shelter who found her as a stray. She is now a happy girl living with her foster family and looking for a forever home. At one point Capelli once was in a home and went through obedience training before she was ultimately returned. She knows her basic commands and a few more advanced ones though she has a drive to learn more. She could do well as an agility dog or just one that knows some fun tricks. Either way she is always ready to do what is asked and aims to please. She is also house and crate trained. Capelli can be selective with the dogs and prefers being with a male dog. It can take her a little bit to warm up to a new dog but if the other dog is confident and accepting she will get there with them. She is protective over food and bones so her adopter should be aware of that. With the right dog and some monitoring she will be fine. When meeting other dogs it is best for her to be off leash. When walking if she is on a loose leash and not feeling super restrained she will do okay, but if she is held tight and feels vulnerable she does not like it. Capelli is not cat friendly and does better with older children since the chaos of small children makes her nervous. Energy wise Capelli has a moderate amount though she can be as much of a laid-back couch potato as well as being a fun and adventure loving dog. She loves when she is with her family and wants to be included in their activities. Capelli would do well as an only dog but she could also do well with another dog that is preferably male. She can get a bit protective over her things which her new family should be aware of if they have another dog. Her adoption fee is set at $250 and she is on the Secondhand Hounds website under the adopt tab in the dogs available for adoption. More information on how to adopt from Secondhand Hounds is available under the adopt tab in how to adopt.